The authors have accomplished their intended goals and produced an excellent textbook in operative dentistry both for beginners as well as for the clinician. With the revision of the earlier edition and addition of four new chapters, the scope and clarity of the second edition has increased tremendously. The book is well organized and readable with useful information compiled excellently. The authors have presented an unbiased up-to-date review of research in clinical practice and restorative materials. The textbook would be of much value for any clinician as a ready reference, particularly with regard to tooth preparation techniques and modalities of restorative techniques. The book is well organized and meticulously illustrated, encompassing all aspects of conservative dentistry, keeping in mind the syllabus prescribed by many universities in India. The initial chapters follow the logical pattern dealing with introduction and basic principles of operative dentistry, which are very useful for the preclinical students. Chapters 7 to 12 depict information about clinical procedures such as cavity preparation, instrumentation, and related aspects. Further chapters on infection control and patient evaluation have been adequately dealt with and explained in an organized manner. 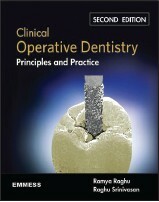 The chapters dealing with various restorative materials such as amalgam, composites, glass ionomers, ceramics, and direct and indirect gold restorations have been given a detailed insight with suggestion of innovative bits and hints of information based on the clinical experience and knowledge of the authors. The description of cavity designs for various restorative materials is exhaustive, informative, and meticulous, especially with reference to internal features of cavity and cavo-surface treatment. Special mention has been made with regard to the description of ceramic restorations including CAD-CAM restorations. Ideal treatment involves selecting intelligent alternatives without bypassing biologic, mechanical, functional, and esthetic requirements, and this aspect has been carefully depicted in relation to all restorative materials and tooth preparations. The neophyte student and the practitioner will benefit from the practical tips and suggestions given by the authors. New concepts based on advances in biomaterials are presented with valid techniques. The textbook is well illustrated with eye-catching color diagrams and apt explanations and information, which enables the student and the clinician to predict success with greater certainty. Apart from color plates and clinical photographs, the book also has some good photomicrographs wherever necessary. A feature is the presentation of important points highlighted in color blocks, along with a self-assessment section in each chapter, which are novel and very useful for the student. Addition of chapters 29 to 32 is a welcome feature to make the textbook complete with latest thoughts on aesthetic dentistry, bleaching, and use of lasers in conservative dentistry. The authors have evaluated the current literature and provided a distillate of information pertinent to current clinical practice in conservative dentistry. This is a well-written, informative, and comprehensive textbook of immense value to everyone involved in tooth preparation for long-term service and oral health. The book should be on the shelves of all those who practice restorative dentistry in day-to-day practice, and for the student it is an excellent bible to learn and practice operative dentistry. This textbook is an excellent reference book for students and teachers in the specialty.